The Georgian Foreign Ministry expresses its extreme concern over the illegal placement of banners by the Russian occupying forces on 10 July marking the so-called “border” on the territory adjacent to the village of Tsitelubani of Gori municipality and the village of Orchosani in occupied Akhalgori district in close vicinity to the Tbilisi-Gori central highway. It is noteworthy that certain segments of Baku-Supsa pipeline run in the vicinity of the both areas and with this illegal action a certain portion of the pipeline next to the village of Orchosani fell within the occupied territory. 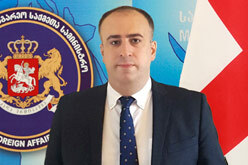 The Georgian Foreign Ministry condemns this illegal action, urges the Russian Federation to take measures to stop this action and calls upon the international community to assess appropriately this move, which is directed against peace and security and grossly violates the fundamental principles of the international law. We will raise this issue in the UN, OSCE, Council of Europe, and will use all international levers not to leave the Russian provocation without relevant response.